Hi, I have a 12yr old male cat who has just spent 2 nights at the vets on a drip. He has been home a couple of days but will not eat or drink anything so he is becoming weaker. I have him on antibiotics but am frightened of losing him…help? Hi Tracey…. thanks for visiting and asking. I am sorry to hear about your 12 year old cat’s illness. Obviously I won’t second guess your vet. I realize that you are very concerned. What I will do is to refer to the reference material that I have, based on what you say. Drs Carlson and Giffin (Cat Owner’s Home Veterinary Handbook) says that “there is considerable variation in the severity” of symptoms of feline viral respiratory disease. Two major viral groups are the major causes of upper respiratory infections in cats. These are the herpes virus group producing Feline Viral Rhinotracheitis (FVR) and the Calicivirus group causing Feline Calici Viral Disease (FCV). See also Feline Viruses. I will presume for the time being that there are no underlying diseases and that one of these viruses is responsible for your cat’s illness. Some cats show mild symptoms while in other cats the disease progresses quickly and is sometimes fatal, I am sad to say. The disease is highly contagious and transmitted by discharge from nose, mouth etc and contaminated bowls and so on. The illness begins with severe sneezing, then conjunctivitis followed by fever, apathy and loss of appetite, which is the stage, it seems, that your cat is at. 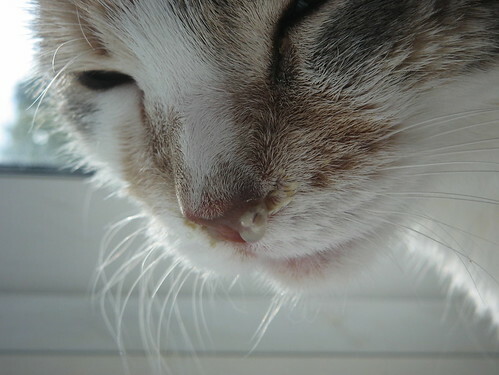 The nasal discharge becomes puslike. I presume that the antibiotics are to treat a secondary bacterial infection producing the puslike discharges. The herpes virus infection develops to a “spastic cough” and possible corneal ulcerations (ulcers on the cornea of the eye). The Calicivirus infection may lead to mouth ulcers, drooling, shortness of breath and possible viral pneumonia. Secondary bacteria infection, weight loss (due to starvation) and dehydration are serious complications. This cat “Mokie” has an upper respiratory infection. This cat is not the subject matter of this article but is added to illustrate the page – photo by sg4w (Flickr). Rest and “proper humidification of the atmosphere are important”. Confine cat to warm room. Use home vaporiser (ideally a “cold steam vaporiser”). Wipe secretions from eyes, nose, mouth with “moist cotton balls”. Swollen nasal membranes can treated by administering Afrin Children’s Strength Nose Drops (0.25%) – this is a USA product please note. A British product that seems to be similar (check with vet, please) is Nasosal. This might be available from Boots. The spray should be administered cautiously to prevent “rebound congestion”. One drop to one nostril for first day is recommended. Then next day the other nostril and then continue for 5 days. Make sure the antibiotics are taken per prescription and in total. It can be difficult to administer antibiotic pills completely. You might leave a comment as to how you are administering the antibiotics. Antibiotics are “important in the management of moderate to severe viral respiratory infections”. Your cat should be encouraged to eat and drink (you imply that this is the major problem and you are correct). Feed “highly palatable food”. Does he have a favorite – give it to him. Make it the best you can. Strained baby food diluted with water is also a possible. The doctors suggest “supplemental fluids can be given in the cheek pouch”. Please ask you vet about this if you think you could try it. It requires a certain knowledge to administer food this way. Once your cat starts to eat and drink the worst is over. Final note: most cats that recover from the acute illness become carriers. Vaccination is recommended to prevent the disease. Hope this helps. Please provide feedback if you have time by leaving a comment – thanks. Tracey I’m so sorry and so sad for you.You did the kindest thing you ever could by letting Ronnie go, to stop him facing a lot of suffering. It did sound to me as if he had more problems than the vet originally diagnosed and wouldn’t have got better. You have shown how much you loved him by taking him back to the vet but I know how hard it is to say goodbye. Be kind to yourself as losing a much loved pet is as much a bereavement as losing a human family member. You never get over it but with time you do become used to them not being around. Thinking about you, take care. I know how close you are to your babies. Let me know if I can do anything to help you through this. I don’t know what else to say except I’m so sorry. I had taken him back as i was so concerned as he wouldnt eat or drink the vet thinks there was more problems maybe cancer and further invasive exploritory procedures may have still resulted in todays sad action, thank you all for your wishes and advice. As it would with me or with my children when young the steaming made such a difference when this happened to Freddie. Initially I went looking for one of those clever machines but they are inordinately expensive. I used to soak towels and put them on the radiator and have bowls of water near fires. Really good luck with your cat. Michael is right in all he advises but if your cat gets any worse or you are very worried about him now, please phone your vet. They won’t mind and advice is free. I hope he’s better soon.